I’m a big believer that real-world examples can teach us about the benefits of good fiscal policy (think Hong Kong, Estonia, Canada, and the U.S. under Reagan and Clinton) and the costs of bad fiscal policy (France, Cyprus, Greece, and the U.S. under Bush and Obama). Today, let’s look at another example of bad fiscal policy. And we’re going to pick on Slovenia since I’m on my way back from the annual Liberty Seminar at Lake Bohinj. I’m motivated because one of the other lecturers at the Seminar was that country’s former Finance Minister, Janez Šušteršič. His basic argument is that Slovenia is at risk of falling behind because of a failure to reduce the size and scope of government. 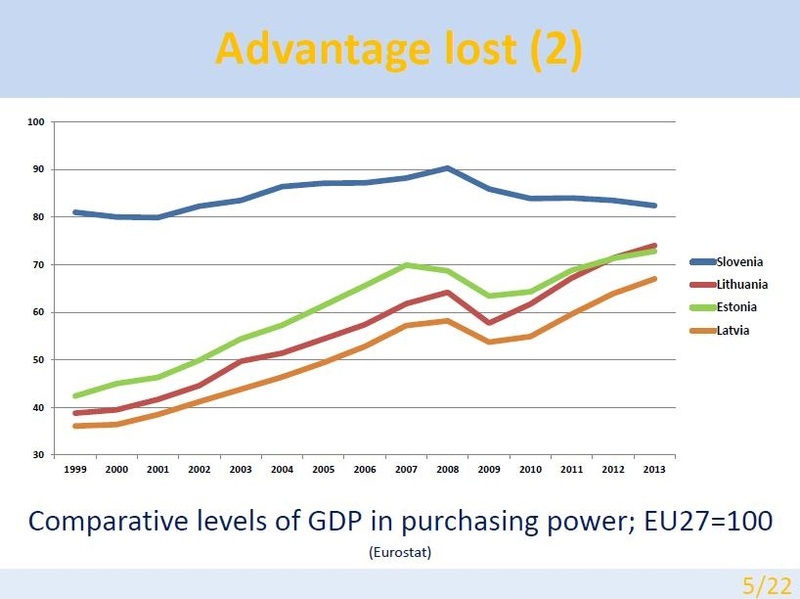 Here are some of his slides, starting with a look at how Slovenia started out richer than many other post-Soviet Bloc jurisdictions, but you can see that other nations (with better track records on reform) are catching up. 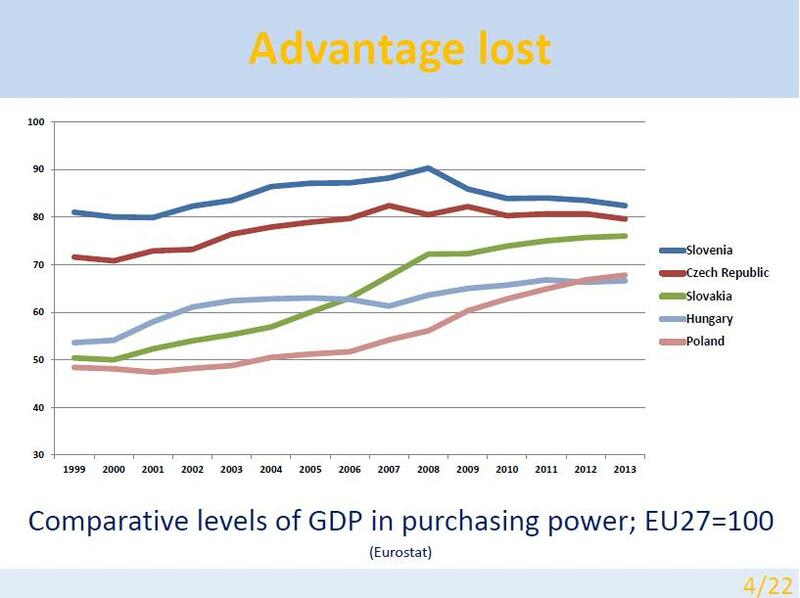 I especially like that he shows the rapid growth of the Baltic nations (hmmm….I guess Paul Krugman was wrong after all). The message from these two slides is one that I often make, which is that faster economic growth makes a big difference over time. You can click here to get links to a bunch of similar examples of how countries with pro-market policies out-pace other countries that chose statism. 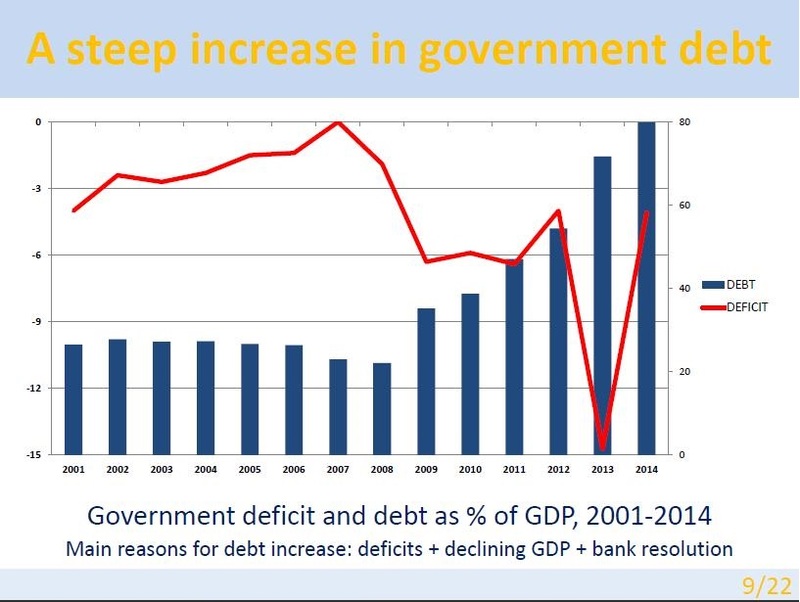 The one disappointment in Dr. Šušteršič‘s presentation is that he looked at deficits and debt when he discussed fiscal policy. Here’s his slide showing a big increase in red ink. You won’t be surprised to learn that I think he should have focused on the underlying disease of too much spending rather than the symptom of red ink. So I went to the IMF data and put together this chart. 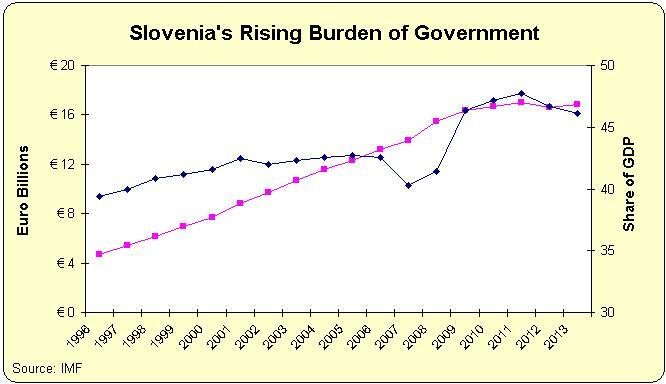 As you can see, the reason that Slovenia has more red ink is that the burden of government spending increased so rapidly in recent years. In the past few years, you can see that spending no longer is growing so rapidly. I’d like to think this is a sign of new-found fiscal rectitude, but I suspect it’s simply a sign that Slovenian politicians realize they may be at the precipice of a fiscal crisis. What Slovenia needs (what just about every nation needs) is some sort of spending cap to enforce long-run and sustainable spending restraint. The Swiss “debt brake” is a good model to emulate. Since you are mentioning former Finance Minister Janez Šušteršič, is good to know some things about him;) You wrote that his basic argument is that Slovenia is at risk of falling behind because of a failure to reduce the size and scope of government. Well that is true. What he didn’t tell you is that he was amongst them who made the scope of government even bigger! 1. He raised marginal income tax to 50% (before was 41%). 2. He raised taxes on electricity, gas and cars. For cars he made taxation even more progressive then before! 3.He introduced new tax on financial service (tax on bills!). Not to mention that he supported tax on financial transancional tax in EU and started proceeding to implement it in Slovenia. He also started process to increase tax on bank assets. And “best of all” he started a proceeding to implement tax on sweet drinks and lottery tickets! 4. The base for contribution taxes was widened. 5. In the law he wrote that in case that budget deficit is higher then 3%, then government can lift the VAT up to 3 precentage points. 6. Some taxes on environment were raised.